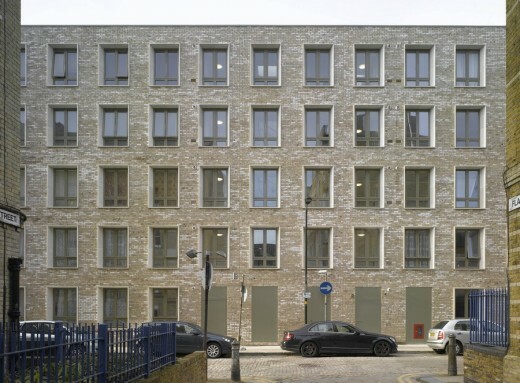 This development at Peabody’s Whitechapel Estate in East London completes an ensemble of six housing blocks surrounding an internal courtyard. 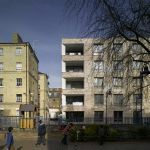 It aims to respect the massing and characteristics of the existing Victorian buildings on one of the oldest Peabody estates. It continues the idea of ‘open corners’, promoting easy pedestrian access and views between the courtyard and the surrounding streets. 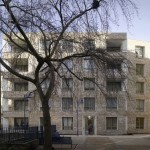 The design of the block takes cues from the typical Peabody housing blocks, designed by Henry Darbishire in the 1860s. 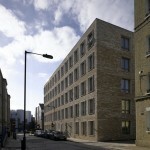 The new block reflects the massing and characteristics of the existing estate blocks. Deep, white reveals around windows and balconies contrast with the brick facade and provide sufficient space for planters on the cills. 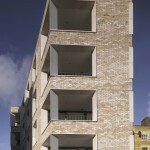 The balconies are positioned within the building envelope, so as to retain a flat brick facade in keeping with the existing blocks. 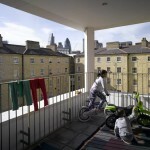 These balconies have openings on two sides to allow a maximum amount of daylight into the living rooms. 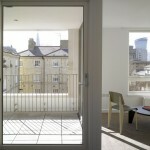 The practice has ensured that central circulation space is generous, with natural light and ventilation. 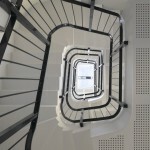 The winding stair has a central void to provide additional light and an important visual connection between the floors. The need for a ventilation shaft has been removed by positioning the required fire lobbies on an external wall with opening windows. 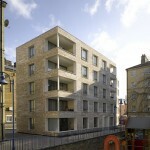 At least half of the thirteen 1,2,3 and 4-bed units will be affordable dwellings.